As the University of California, San Diego celebrates its 50th Anniversary this year, the university’s legacy of community service has been recognized by the Washington Monthly as the top college in the nation according to new rankings measuring “what colleges are doing for the country.” The publication announced in its September “College Guide” that UC San Diego is ranked first in the nation for service. 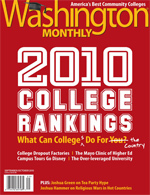 UC San Diego was honored by Washington Monthly for its cutting-edge research that drives economic growth, provides upward mobility to people from low-income communities and molds the characters of tomorrow’s leaders. 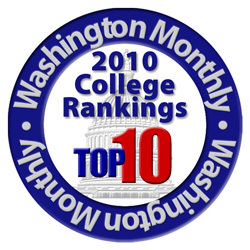 UC San Diego was recognized as the top university by the Washington Monthly based on three criteria: social mobility, research and service—which includes how many students participate in the Peace Corps. UC San Diego and the Peace Corps, both turning 50 this year, have partnered to bring 630 UC San Diego alumni as overseas volunteers. Currently, 46 alumni serve in the Peace Corps, playing a vital role in solving real-world problems and improving the lives of people around the world through advanced healthcare, continuing education and public programs. “Giving back” is a philosophy embraced in Fox’s Volunteer50: The Chancellor’s Call to Service, a key component of the university’s 50th Anniversary celebration. 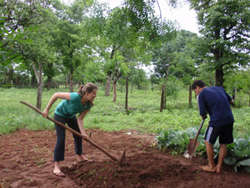 The initiative encourages the entire campus community, including students, faculty, staff, alumni and university friends, to perform 50 hours of volunteer service during the 2010-2011 academic year. Fox has set a goal of reaching at least 50,000 cumulative volunteer hours during this milestone year. “Giving back” is important to Christopher Yanov, a 1999 UC San Diego graduate who has dedicated his life to service and successfully improved the lives of youths in underserved communities. Since graduating, Yanov has raised more than $1 million in scholarship funds for high-risk students to attend top-ranked universities such as UC San Diego. He is the founder and executive director of Reality Changers, a San Diego organization dedicated to supporting highly-motivated, inner-city high school students with the academic and financial resources to become the first in their families to attend college.